Germany may cut Greece some slack after its voters backed a pro-bailout party in weekend elections, with officials saying Athens might get more time to meet its savings goals, though longer-term economic reforms were still set in stone. By Stephen Brown and Annika Breidthardt. German officials, seeing the conservative New Democracy’s win as a vote to keep Greece in the euro zone and respect the terms of the European Union and International Monetary Fund bailout, struck a conspicuously softer line. Foreign Minister Guido Westerwelle – mindful perhaps that many Germans express impatience with Greece in opinion polls – said the substance of structural reforms in the Greek public sector to reduce its debt and spending were “not negotiable”. But he added that, because Greece had suffered a “political standstill” for more than a month due to the election campaign, there should be discussion of budget deficit goals, monitored by a “troika” of EU, IMF and European Central Bank inspectors. “We are ready to talk about the time-frame as we can’t ignore the lost weeks,” Westerwelle told German radio. However, a Berlin government spokesman made clear there was no question on going back on key economic reforms to slim down the public payroll, close loss-making public enterprises, privatise state assets and crack down on fraud and tax evasion. “Now is not the time for any kind of “discounts” to Greece,” deputy government spokesman Georg Streiter told a news briefing. The impression that Germany might be prepared to reward Greece for delivering the election result that Chancellor Angela Merkel herself had urged was reinforced by a deputy finance minister making unusually conciliatory noises. Steffen Kampeter, a stickler for fiscal rectitude who hails from Merkel’s own Christian Democrats (CDU) unlike Westerwelle, said it was “clear that Greece should not be over-strained”. The German media were also supportive, potentially making it easier for Berlin to offer Athens some extra time. “Greeks vote for the euro,” was the headline across most newspapers, which focused on the Germany-Greece clash in the Euro 2012 soccer championship on Friday. The mass-circulation Bild daily expressed condescending admiration for Greece’s team for “playing for a country that is kaputt”. 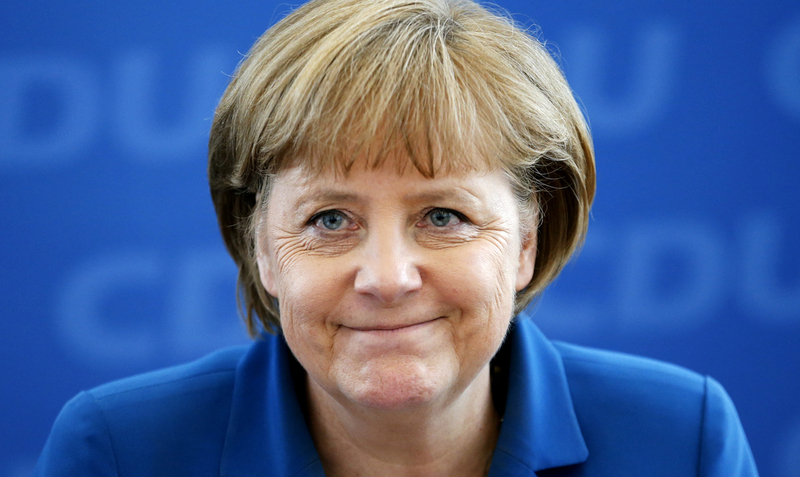 Merkel was initially reluctant to agree to the first Greek rescue package in 2010. She imposed ambitious reform targets on all over-indebted euro zone states seeking aid and pushed for tough new budgetary rules across Europe, which 25 out of 27 European Union member states have agreed upon. The centre-right chancellor had repeatedly warned Greece before Sunday’s election of dire consequences for its membership of the single currency if it voted for anti-bailout parties led by the hard-left SYRIZA. Merkel took the rare step of attempting overtly to influence the outcome of an election in a fellow EU state by emphasising on Saturday why it was “so important” that the Greek public should elect a party committed to keeping Greece in the euro. Although some government sources tried down play down the comments by Westerwelle, not a key figure in the debt crisis, foreign ministry officials said he had conferred with Merkel repeatedly over the weekend about the Greek situation. With Merkel and Finance Minister Wolfgang Schaeuble at the G20 summit in Mexico, it was left to the deputy government spokesman to attempt to project unity in the cabinet. But both Kampeter and Westerwelle were adamant there should be no easing of Greece’s wider reform targets, with Kampeter saying Greece’s EU creditors believed the release of further aid tranches hinged on Greek government commitment to these goals. One cornerstone of the Greek rescue operation is the need to cut the debt-to-GDP ratio to 116.5 percent by 2020. Creditors now have to decide whether to release 1 billion euros withheld from the last aid tranche. This depends on a new troika report which can only be carried out once a new government is in place. The troika is expected to return to Athens in early July and is likely to conclude that the country has not yet fulfilled the terms of the bailout memorandum, EU officials say. Another German official, who asked not to be named, said any suggestion of granting Greece more time for its reforms could look like a third rescue scheme “and we’re far away from that”.